Here are some link to various sites and organizations. Greyhound Pets of Arizona does not endorse these people/places, we just thought we'd share them with you. A community network of Greyhound owners with ongoing discussion on numerous topics, such as healthcare, feeding, training, etc. You will need to sign-up to participate. John has offered to answer any general questions for Greyhound owners or prospective owners in the Phoenix area. Katie Reardon created MyApartmentMap It is a housing search web site that has pet friendly listings all over the USA. This could help people from giving up their pet due to moving. She created this web site after searching for an apartment that would accept her Jack Russell and her Beagle. As a pet owner she found it difficult to find pet friendly apartments, and wanted to help other pet owners find a home quick and easy. Dog owners often find themselves facing a particular dilemma when trying to secure homeowner's insurance. While insurance is a must for anyone wanting to own their own house, many home owners face higher premiums, inferior policies, or even blacklisting by insurance agencies -- simply because they own a dog. General service dog information, not Greyhound specific. There are several Greyhound service dogs we know of. National therapy dog group...a great way to share your dog with others who can't have one. General guidelines for safe travel with your dog, not Greyhound specific. These folks make beautiful Martingale collars at very reasonable prices. Their "Mother Bunny" fleece toys are among the most durable you'll find. (We have some that are over a year old and look like new—with 7 dogs in the house!) They donate 100% of the profits from the sales of these items to the Greyhound rescue community at large—over $14,000 in 2008. Beautiful, unique items for Greyhounds & the people who love them. Greyhound coats, etc. Greyt sales! A strictly a FUN-Draising enterprise contributing 100% of earnings to greyt causes. Unique greyhound gifts and Unusual Jewels are offered on the website and on eBay by "Greytstuff". Sign up for "Insider Trading" to receive weekly announcements of fundraising events. PawPosse.com specializes in quality dog supplies. They will donate 10% of your purchase to Greyhound Pets of Arizona when you use promo code GPA. 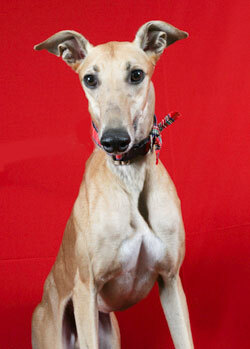 Our webmaster and event photographer, Nick does Greyhound photos at special events and fundraisers to benefit GPA-AZ. Located near Sedona, you can schedule a session in scenic Northern Arizona or watch for one of the special event sessions on our home page. He has done holiday portrait fundraisers for the past several years. 747 N. Val Vista Dr. When a loved one is badly injured, chokes, or stops breathing, people need to understand what action to take. For that reason, learning basic first aid and CPR is of the utmost importance. Most often, however, when a person thinks of learning these skills, it is for the benefit of humans, with little or no thought given to emergency care for their pets. Animals such as dogs or cats may also become injured to the point that they require emergency care. When this happens, people are often at a loss for what needs to be done and how. For serious injuries, pet owners will want to get their pets to a veterinarian as quickly as possible. Basic first aid will help to keep the animal stable until it reaches professional care. The type of first aid administered depends on the injury or exposure that has occurred. A national pet rescue and adoption assistance service also offering general and health related articles and resources for all types of pets. The National Greyhound Association has published a resource list of credible, responsible adoption groups to our membership, owners, kennels, haulers and trainers. It is our goal that the list may also prove to be an assistance to those coordinating hauls and hopefully will be another re-direct for those looking to adopt. The list is comprised of groups we feel are responsible in practices as well as their professionalism towards our sport and dogs. It is a working list, adding and changing as more information is shared, groups come and go and industry demographics change. Greyhound adoption in Northern California. Click to see their available dogs. If you are seeking a Greyhound in the Las Vegas area, check out their available dogs. Click to see their dogs now.